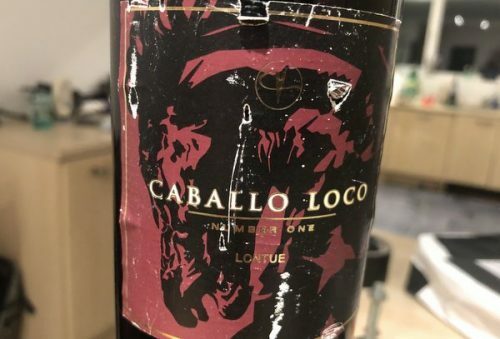 If you buy lots of wine, then it’s common to overlook bottles, only to encounter them in some nook or cranny of the cellar and think, ‘I should have drunk this sooner.’ Then you go into denial, and because you don’t expect the bottle to be any good, you leave it there neglected. Then you think: I’d better try it before dumping it. I did this with a bottle of Chilean wine that I bought for less than £7 a bottle 21 years ago. It’s the Caballo Loco from Valdivieso. In the early days of internet forums on wine, we discussed this quite a bit. It was a very ambitious Chilean wine, imported by Bibendum (in their glory years), and interestingly the wine was made as a blend across vintages. I think it’s now in its 17th incarnation (released), and is a proper solera system. Here’s my note, and I’ve also found a not on wine anorak from 1997! Here’s my note from August 1997 (which reminds me that wineanorak has been going longer than I thought! This is 21 years ago, and this bottle was purchased at the same time).